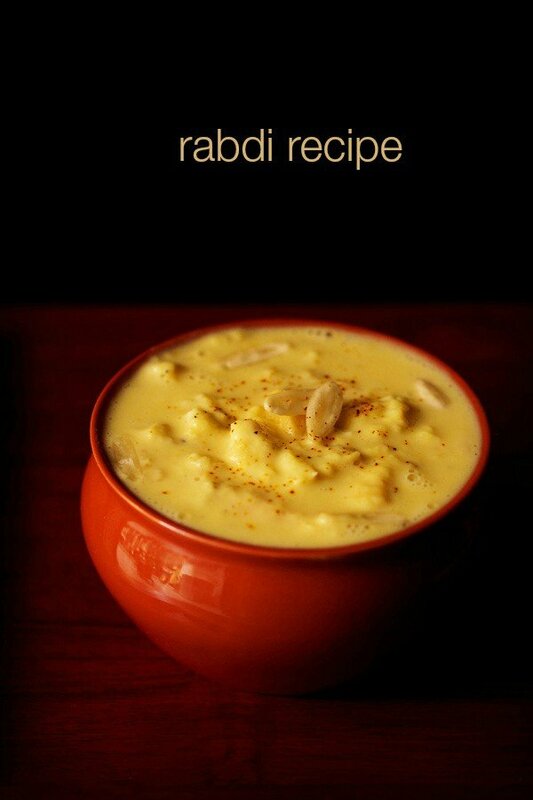 rabri or rabdi is a traditional indian sweet of thickened sweetened milk with layers of cream. also known as lachha rabri in hindi. rabri recipe – a step by step post to make rabri the way its made traditionally. rabri is a popular north indian sweet made from milk. basically rabri is thickened sweetened milk having layers of malai or cream in it. 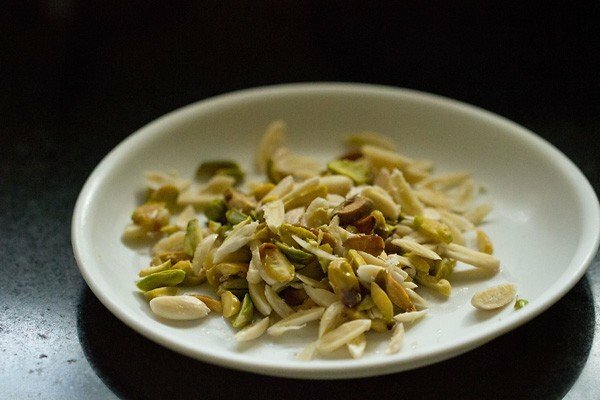 its flavored with cardamoms, saffron with the addition of dry fruits like almonds and pistachios. this version of rabri is also called as lachha rabri in hindi. the preparation is easy but takes time. milk is continuously simmered and reduced on a low flame till it reaches a semi thick consistency. 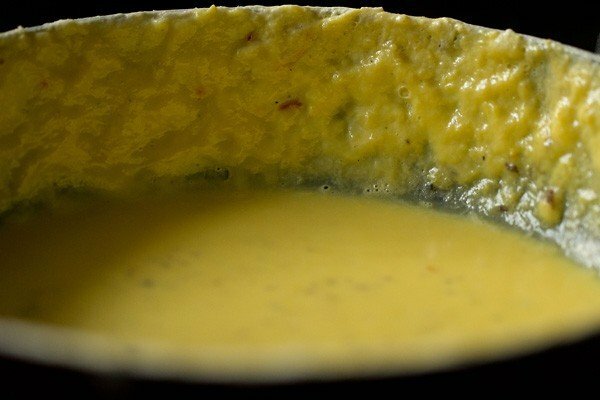 rabri is usually prepared in a kadai as the broad shape of the kadai helps in evaporation of the milk faster. you can also use a shallow broad pan instead. 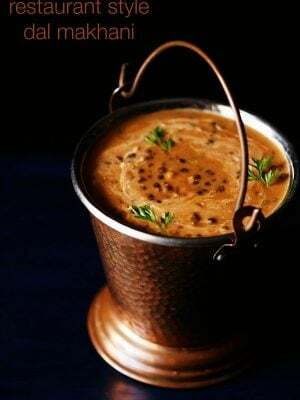 the pan or kadai has to be thick bottomed or else the milk gets scorched or burnt from the base. the step by step pics are from two different occasions i made rabri. 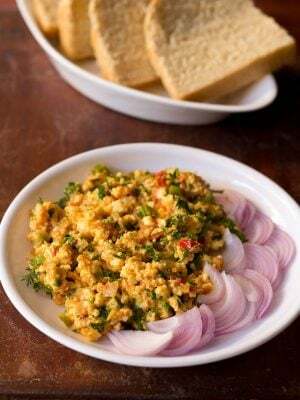 once i just made plain and the next time i made it to be served with malpua. preparing rabri is easy but you have to give it attention. 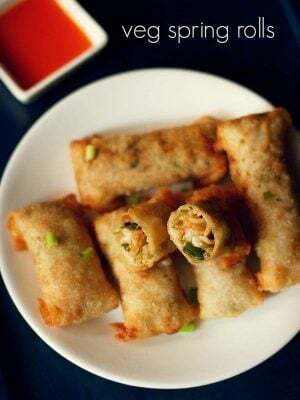 there is no short cut method to this traditional recipe. 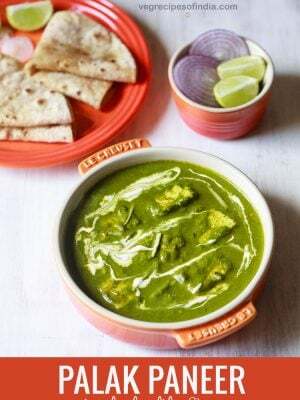 so i do suggest to prepare this recipe when you are working in your kitchen and cooking something else too. but remember not to get absent minded while making rabri. rabri can be served warm or chilled. you can also serve rabri with shahi tukda, gulab jamun, jalebi and falooda. and yes rabri tastes good with pooris too. 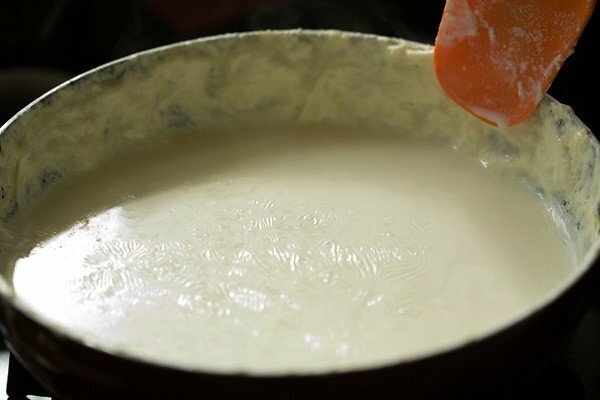 take 5 cups or 1.25 litres of full fat whole milk in a thick bottomed kadai or pan & begun to heat the milk on a low to medium flame, till the milk starts to froth or form a layer of cream/malai on top. so when you will see the cream floating on top, then with a spatula, gently move the cream layer. bring it towards the side of the pan and stick it to the pan. keep on simmering the milk like this and collecting the cream layer on the sides. meanwhile soak almonds and pistachios in hot water for 30 minutes. then remove their peels. slice or chop them and keep aside. do keep a check on the simmering milk when soaking as well as slicing the almonds, pistachios. this process of collecting the cream layer has to be done many times. continuous simmering of the milk will bring the cream on top and you have to bring & stick it to the sides. in between also stir the milk gently on occasions, so that the milk does not get burnt from the bottom. if you do too much of stirring and if quickly, then you won't get the layers of cream in the rabri. you can also just thicken and scrape the milk solids from the sides like i have done for shahi tukda rabdi. but in this case you won't get the layers of cream or malai in the rabri. but both versions taste good. once the milk reduces to half, then add 2.5 to 3 tbsp sugar. you can add sugar as per your taste. then add a 12 to 15 strands of crushed saffron and 1/2 tsp cardamom powder. stir gently. continue collecting the cream and bringing it to the sides of the pan. also do stir the milk gently after you bring the cream towards the sides of the pan. if you don't stir the milk then there is a possibility of the milk getting browned or burnt from the bottom. 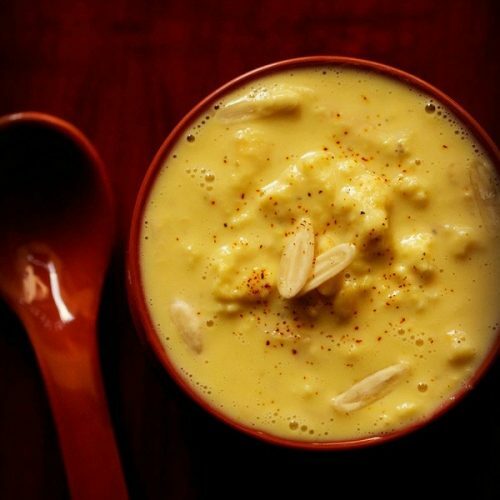 after adding saffron, the color will change gradually to a yellow color as the milk keeps on reducing. when the milk gets reduced to 1/3 or 1/4 of its original quantity, then switch off the flame. it took me about 1 hour 15 minutes on a low flame initially and medium flame towards the latter stage. the cream layer will be collected on the sides. scrape off the entire cream layer as well as dried milk solids and add to in the thickened milk. stir gently. then add the sliced almonds & pistachios and 1 tsp rose water or kewra water. stir gently again. 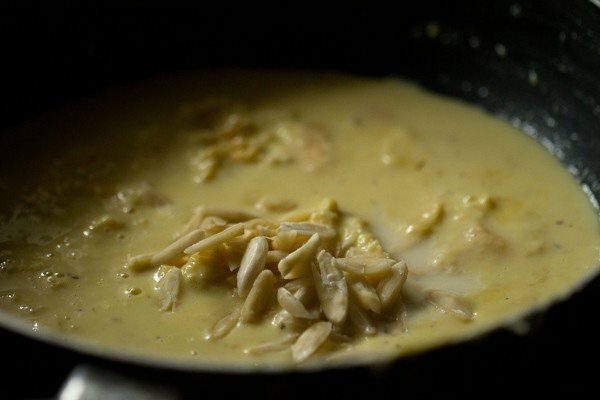 garnish with some sliced almonds and serve rabri hot or warm or chilled. 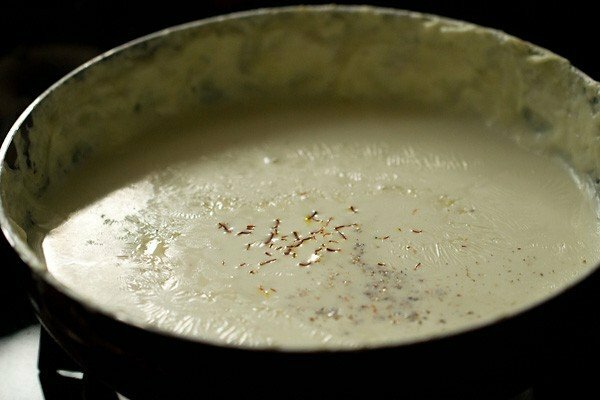 1. take 5 cups or 1.25 litres of full fat whole milk in a kadai & begun to heat the milk on a low to medium flame, till the milk starts to froth or form a layer of cream/malai on top. 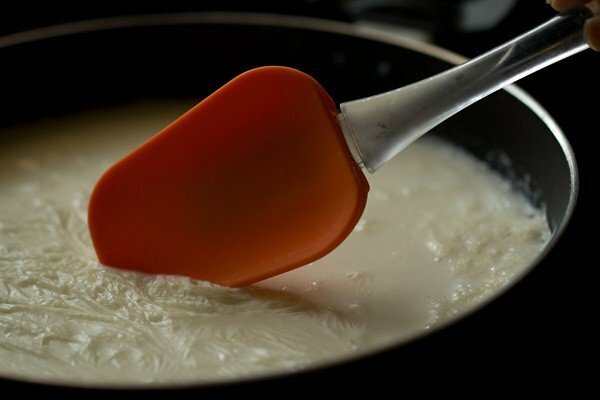 2. so when you will see the cream floating on top, then with a spatula, gently move the cream layer. 3. and bring it towards the side of the pan and stick it to the pan. 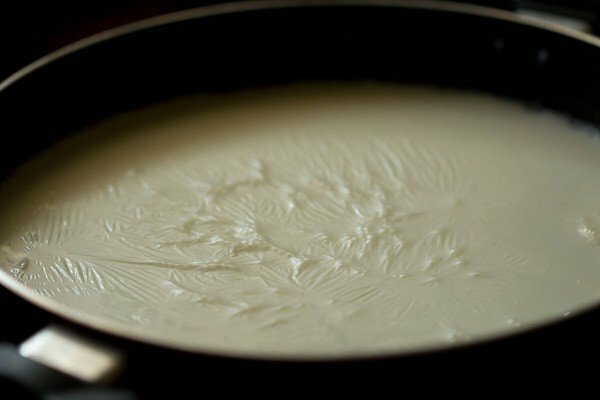 4. keep on simmering the milk like this and collecting the cream layer on the sides and sticking it to the pan. 5. meanwhile soak almonds and pistachios in hot water for 30 minutes. then remove their peels. 6. slice or chop them and keep aside. do keep a check on the simmering milk when soaking as well as slicing the almonds, pistachios. 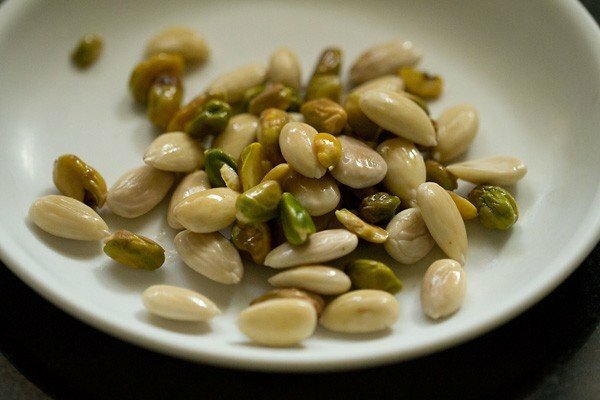 you can even use either almonds or pistachios. 7. this process of collecting the cream has to be done many times. continuous simmering of the milk will bring the cream on top and you have to bring & stick it to the sides. in between also stir the milk gently on occasions, so that the milk does not get burnt from the bottom. if you do too much of stirring and if quickly, then you won’t get the layers of cream in the rabri. 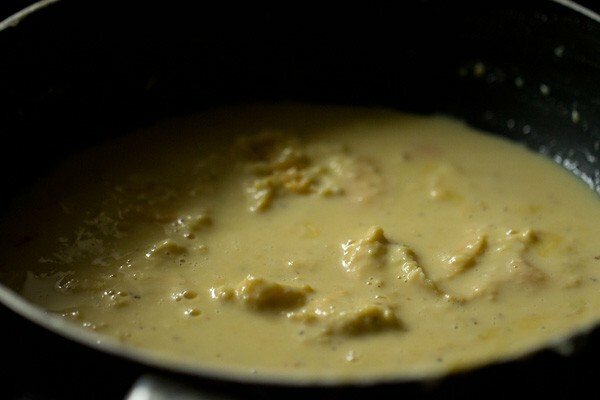 you can also just thicken and scrape the milk solids from the sides like i have done for shahi tukda rabri. but in this case you won’t get the layers of cream or malai in the rabdi. but both versions taste good. 8. here the milk has reduced to half about 30 minutes later. and you will see the layers of cream collected on the sides has thickened also. 9. once the milk reduces to half, then add 2.5 to 3 tbsp sugar. you can add sugar as per your taste. 10. then add a 15 to 18 strands of saffron, which have been crushed and ½ tsp cardamom powder. stir gently. 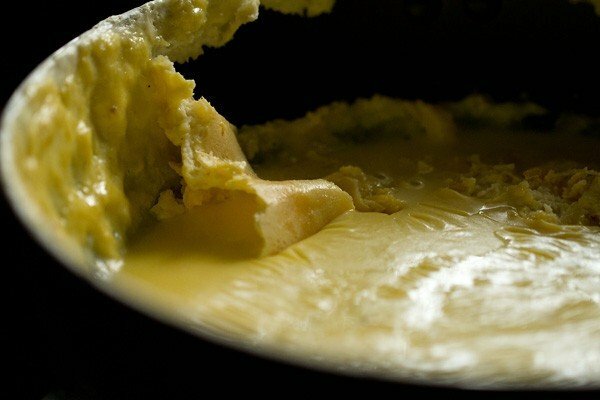 11. continue collecting the cream and bringing it to the sides of the pan. 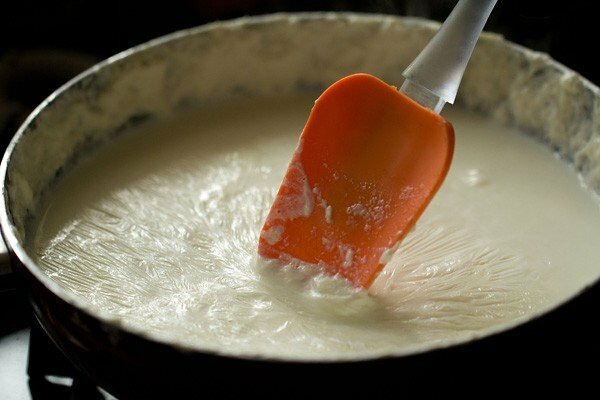 also do stir the milk gently after you bring the cream towards the sides of the pan. if you don’t stir the milk then there is a possibility of the milk getting browned or burnt from the bottom. 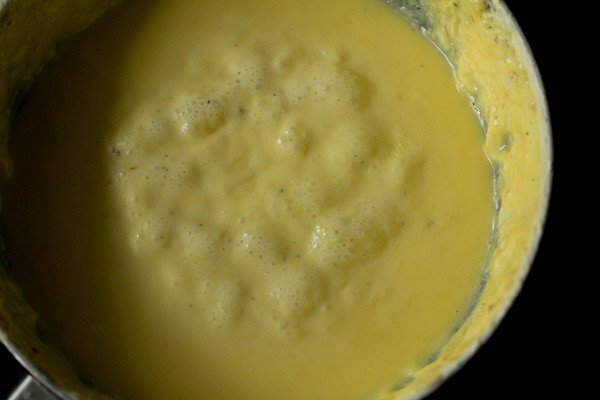 after adding saffron, the color will change gradually to a yellow color as the milk keeps on reducing. 12. here the milk has got reduced to ⅓ of its original quantity. you can even reduce the milk to ¼ of its original volume. switch off the flame. it took me about 1 hour 15 minutes on a low flame initially and medium flame towards the latter stage. 13. the cream layer will be collected on the sides. 14. scrape off the entire cream layer as well as dried milk solids and add to the thickened milk. 16. then add the sliced almonds & pistachios and 1 tsp rose water or kewra water (pandanus extract). stir gently again. reserve a few dry fruits for garnish. 17. then garnish rabri with some sliced almonds, pistachios, crushed saffron and serve rabri hot or warm or chilled. 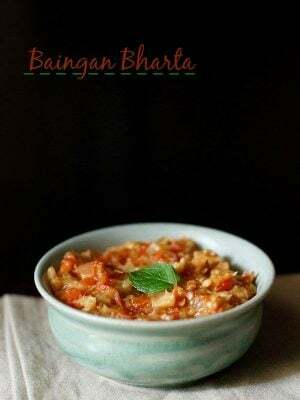 Yummy and easy.made this today yo go with your jalebi recipe. Have to stop myself from eating too much. thank you dinah for sharing the feedback and the rating. yes jalebi and rabri is an irresistible combo. happy cooking. I made the rasgullas from recipe from another site. They did not hold well, so I went to your site to use those rasgullas in making the rasmilai which turned out really really great. 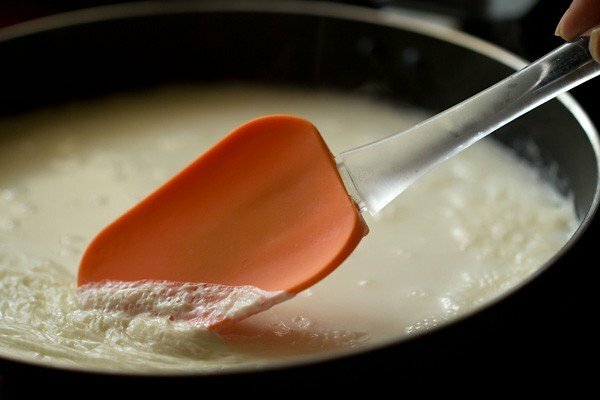 I have a question about the milk that is used for rabri. I live in Canada and the homo milk has 3.25% fat. This milk does not form layers of cream like I saw on this recipe. 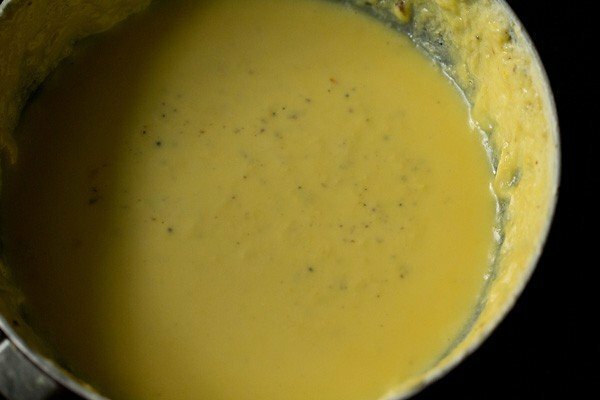 What is the fat % of the milk that you are using for this recipe. Thank you so much. I love your website and I am here to stay. Please respond as soon as you can. Welcome Tina. I have used full fat milk. it is 100 percent fat. Hi Dasanna! Love your recipes! Truly mouth watering! Well, I have a very strange question. Can we use more quantity of toned milk instead of full fat whole milk? jayasri, you will need to give a try. usually for rabri, full fat milk is the best. but i think it should work. adjust the amount of sugar, dry fruits, saffron as required. May I know which brand milk did you use? Here Amul Taaza and Nestle A+ are available. welcome jayasri. i used organic milk for this recipe. you can use amul gold. 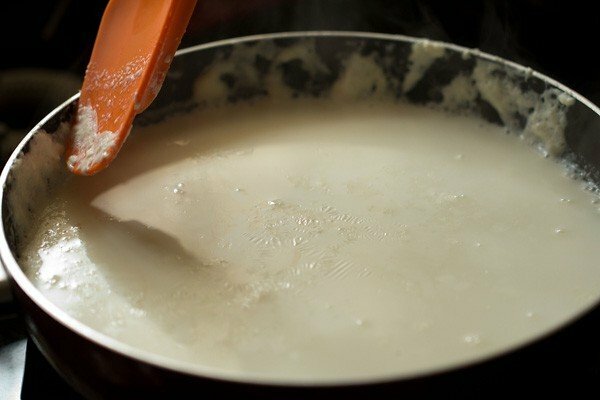 while making rabdi milk spoiled what can be done with the milk? sandhya, strain the milk and then you will get rich chenna. 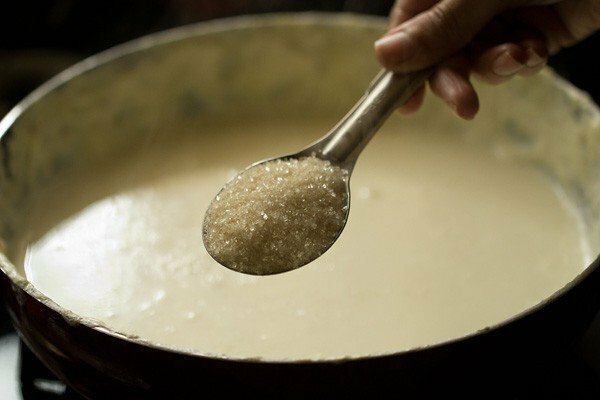 just mash the chenna or grind with sugar in mixie. then make sandesh. or you can cook the ground chenna lightly and then make sandesh. or you can let the entire water evaporate. add sugar. 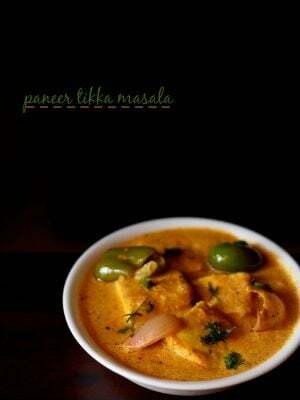 and make a paneer like sweet. 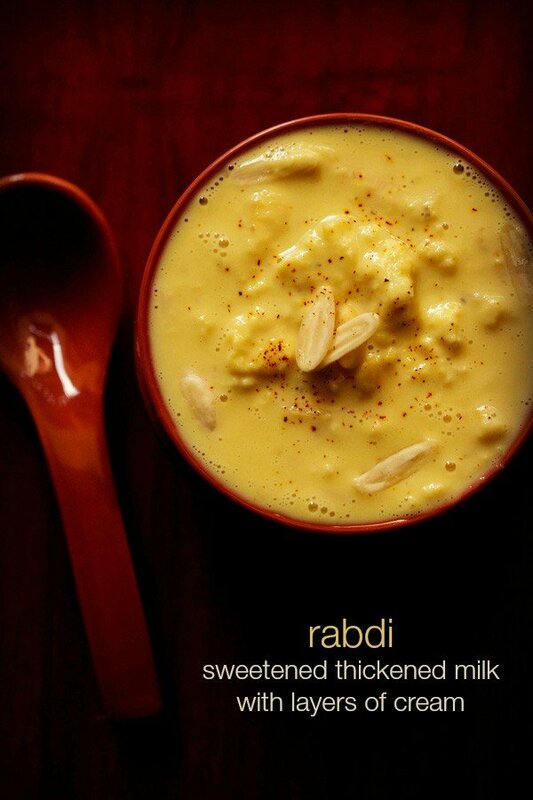 rabdi getting a sour taste is due to using milk which is one the verge of getting spoiled or a bit spoiled. hope this helps. 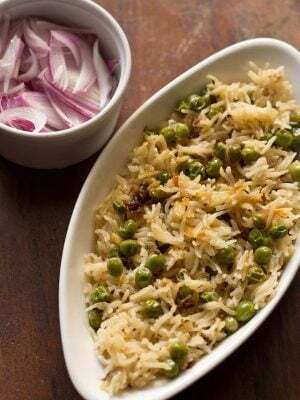 I m a new cook…. and vegreceipes is the guide for me …. Helping me to experiment new receipes as i get bored eating the same food again n again. I made the rabri for the very first time and it tastes divine. Will make the malpua tomorrow for holi. Thanks a ton yet again dasana. pleased to know this thankyou so much sridevi for your kind and honest words 🙂 wish youa dn your family a happy holi. I had made rasmalai earlier too with the traditional method of rabri. 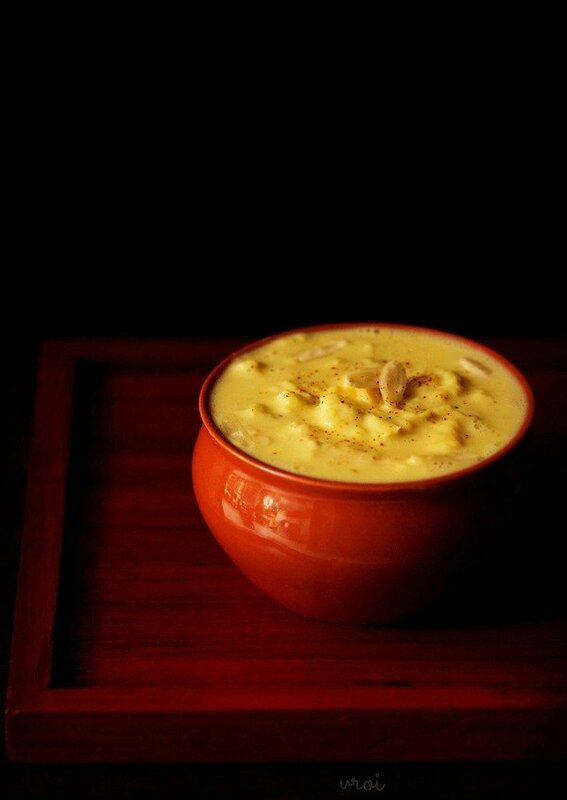 This time I want to make it again but I am confused about which will taste better rasmalai with condensed milk or the traditional method. Please help me out. kaur, the traditional recipe is better. 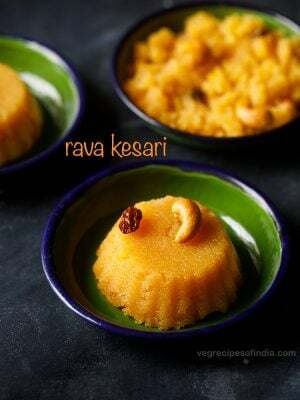 with condensed milk, i always find the rasmalai to be more sweet and plus one does not get the malai wala texture of rabri in condensed milk. if short of time, then you can use condensed milk. Thank you . I will make it again soon.